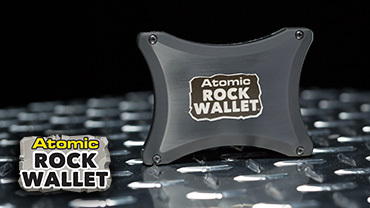 Atomic Rock Wallet™ has RFID-blocking technology to protect your sensitive credit card information. Whether it's dropped or doused, Atomic Rock Wallet™ survives the toughest punishment. Get your Atomic Rock Wallet™ for only $19.99 plus shipping and handling. But wait - double your order and receive a SECOND Atomic Rock Wallet™. Just pay a separate fee. This offer isn't available in stores, so order now! Hear from other Atomic Rock Wallet™ customers how much they love it, and why you will too! Check out all the news for Atomic Rock Wallet™ and its creators at TeleBrands featured all over the world.